To intensify the fight against tropical eye diseases, in particular Trachoma, "The French West African Institute of Trachoma" is provisionally installed in Dakar after the Second World War. On the 1st of January 1953, it is moved to Bamako and is named I.O.T.A. 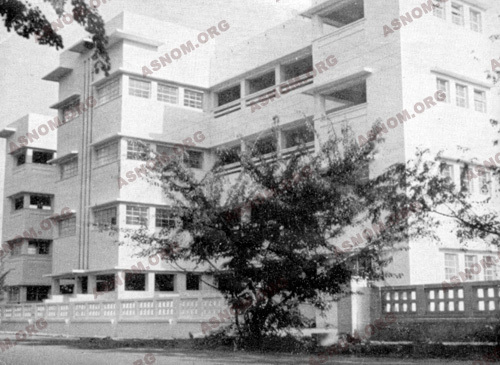 ("Institut d'ophtalmologie tropicale appliquée", rapidly renamed "l'Institut d'ophtalmologie tropicale d'Afrique"). Destined at the beginning to combat Trachoma in Sudan, its capacities are enlarged to deal with other ailments leading to blindness and its services extended to other states of the region. The ailments concerned are those that affect public health. The polyvalence of the establishment brings it quite naturally to a relationship with the SGHMP, to start with, and then with the OCCGE. Its direction is assured at the beginning by Robineau*. - To perform expert appraisals and operational missions at the demand of member states. - To train medical students in the School of Bamako, as well as doctors and nurses sent to it by these States. - To ensure fundamental clinical research and the study and clinical treatment of eye diseases (The IOTA will become the WHO centre of collaboration in 1979, after the return of military physicians of the Health Service). - To ensure the diagnosis and treatment of patients in Mali and in the bordering states which request them. The ailments that are treated change with time: at the beginning, essentially trachoma and onchocercosis; later on cataracts, glaucoma and all sicknesses that may lead to blindness, notably leprosy. From this time onwards, the IOTA has developed considerably, training about ten ophthalmologists and about twenty specialised nurses every year for service in the states, and ensuring a world-renowned research programme.